I was looking for a simple cocktail dessert to go with a Jamie's 30 Minute Meal I was preparing and went back to my (late) childhood to a dessert I remember my parents making. It's a quick an easy recipe - perfect for the 30 minute meal concept and I've no idea where it came from, but I've suitably adapted it from the original! This recipe does come with a warning. 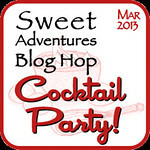 It's perfect for the boozy Sweet Adventures Blog Hop cocktail blog hop hosted by JJ from 84th&3rd and is inspired not only by my childhood, but my hubbie's recipe for the Toblerone creamy cocktail! Just prior to serving sprinkle a little coooa over the top before digging in.